A shepherd without a flock, a shepherd’s pie without any meat. This is an “unemployed shepherd’s pie” because there are no animals being shepherded into it! 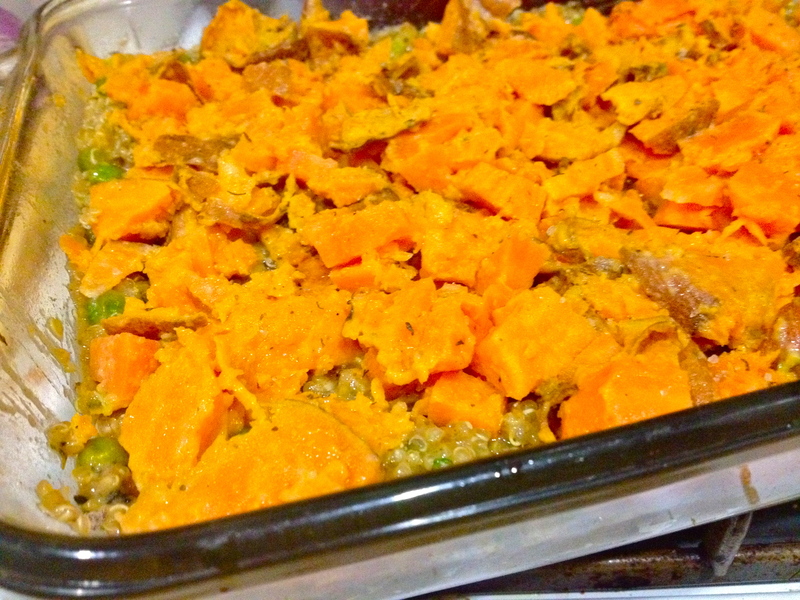 A little twist on a previous recipe, my vegetable pot pie, this yummy baked veggie and quinoa dish crowned with creamy mashed sweet potatoes is a meatless, gluten-free, almost guilt-free indulgence (there’s a cup of half and half in it, which adds some fat and keeps it from being vegan). A creamy, savory, and super filling dish, it’s also totally versatile, so play around with the veggies. 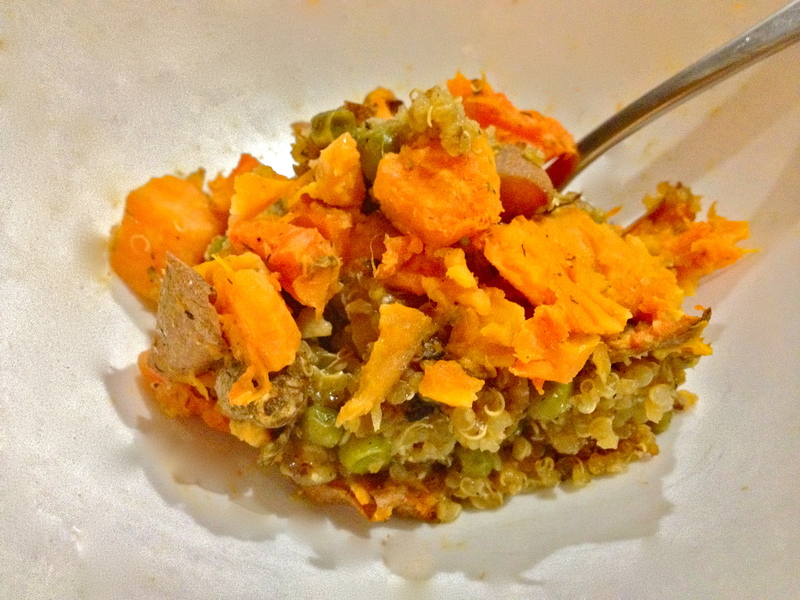 Carrots and celery are always welcome, spinach or leeks would be a great addition, and maybe add a little bit of hot sauce right into the quinoa to provide a bit of a kick. It’s meant to be a flexible, peasant-food-y kind of meal for a chilly, hungry night. Vegetarian comfort food at its best! Pierce each potato a few times and place on a baking sheet. Bake until soft, about an hour. Set aside. Add quinoa and vegetable broth to a small pan. Bring to a boil, then turn down and simmer until all the liquid is absorbed. Set aside. 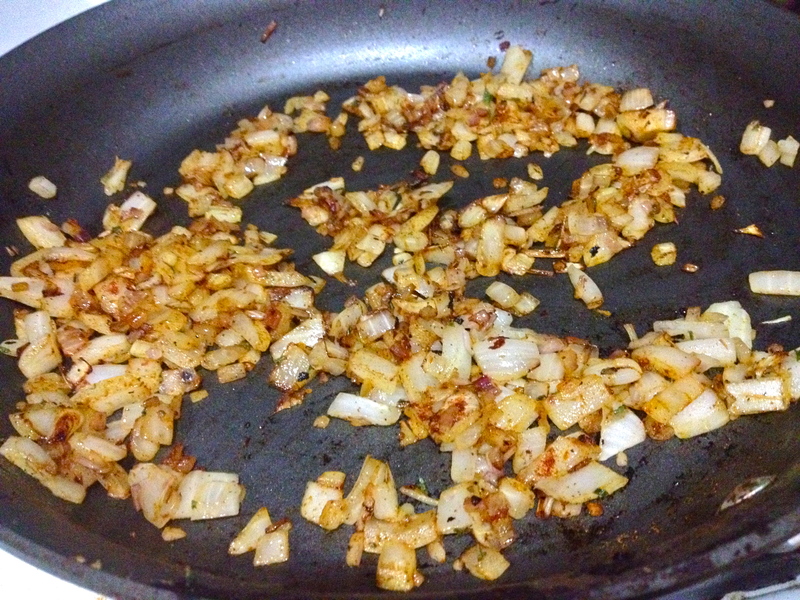 Add olive oil to a pan over medium and cook onions, shallots, paprika, cumin, rosemary, salt, and pepper until the onions have softened. Stir in the garlic and cook 1 minute. 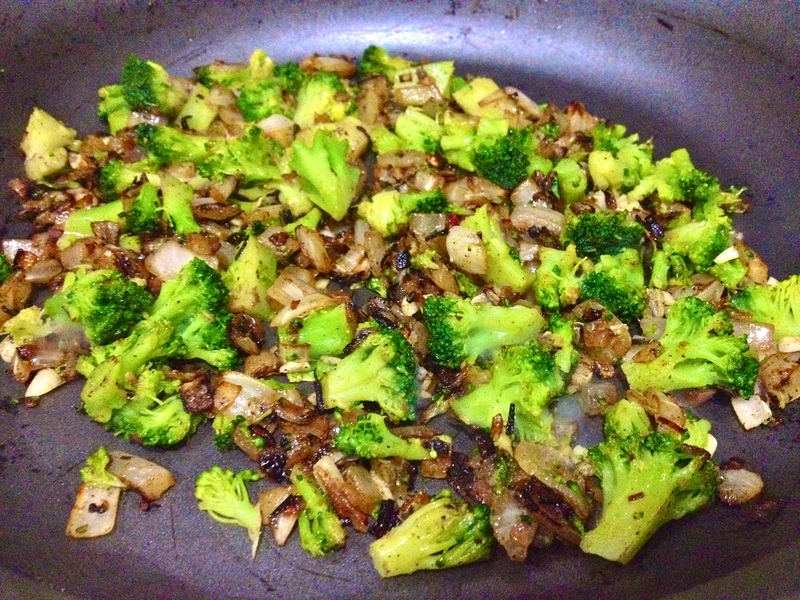 Then add broccoli and cook until starting to soften. 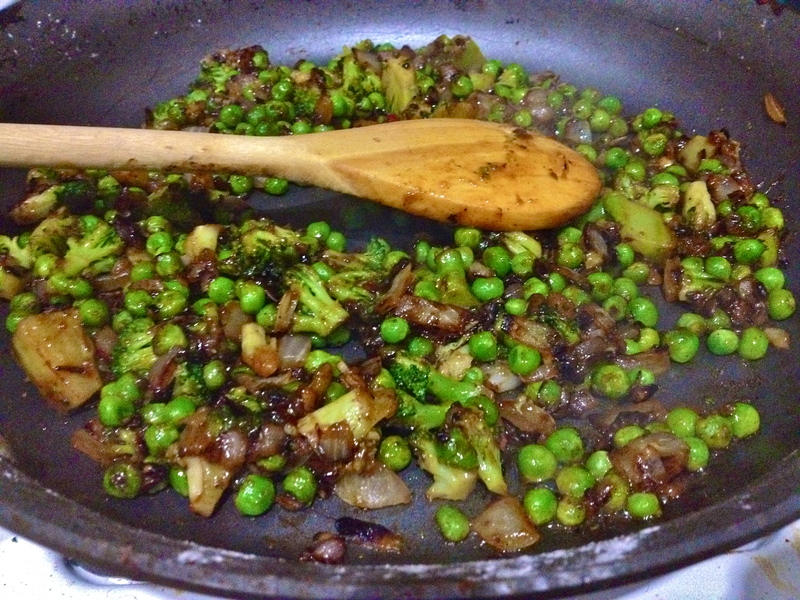 Add peas and stir, cook for 30 seconds, and stir in the starch. Turn down the heat to medium low and cook for one minute. Now add the soy sauce, wine, and lemon juice. Cook for another minute. Stir in 3/4 cup of half and half and simmer until it becomes like a thick sauce. Remove from heat. 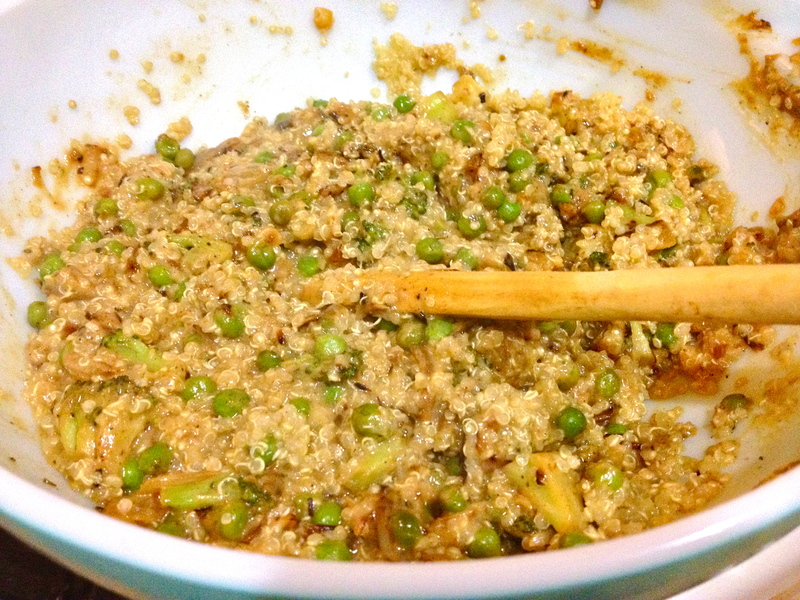 In a large bowl, combine quinoa, vegetable mixture, and parsley. In another bowl, mash the sweet potatoes, skins on, with the remaining 1/4 cup of half and half. 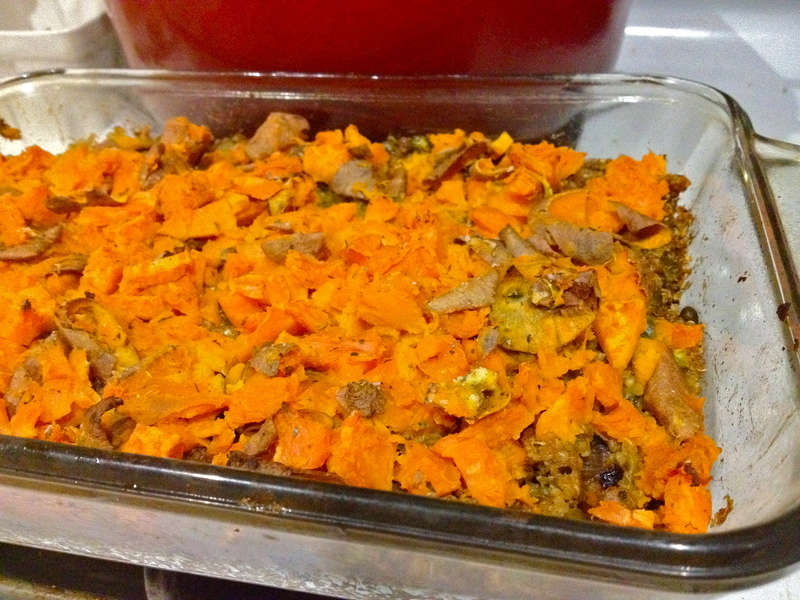 Spread quinoa mixture into a greased pan and top with the mashed sweet potatoes (mashed if you’re more patient than I was–I just kind of roughed them up a bit and spread them over). 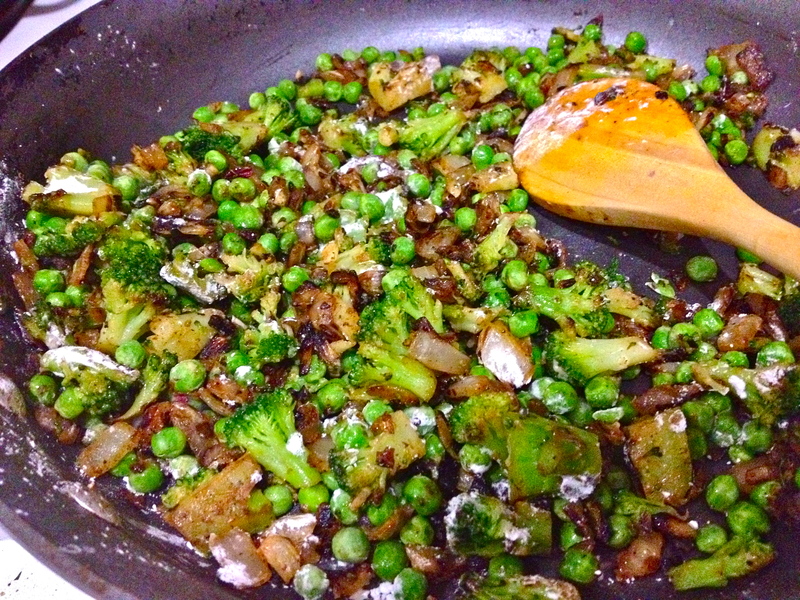 Sprinkle with additional salt and pepper if you like. Bake 1 hour or until the top starts to get crunchy in places. Cool a bit before serving and dig in! Previous Baked Zucchini and Summer Squash Chips. Nice blog! Thanks for sharing your recipe. 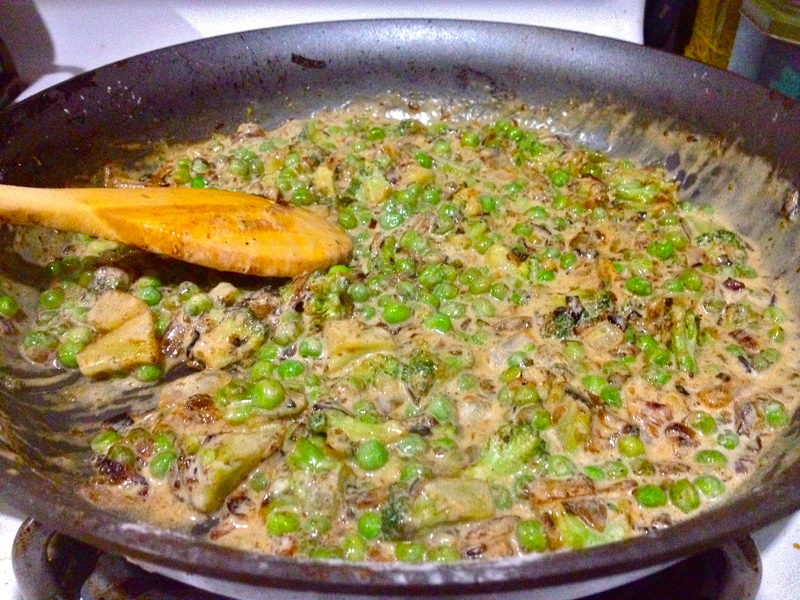 I like this meatless idea for shepherd’s pie. Can’t wait to try! I like the name of your dish. Thanks for sharing.